Life Between Pages: Breaking Dawn Part 1 – my after-watching thoughts! 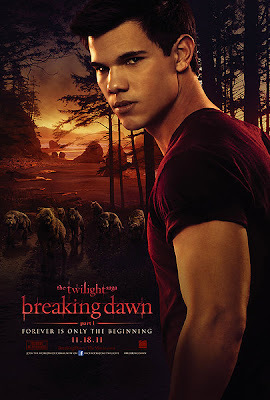 Breaking Dawn Part 1 – my after-watching thoughts! I love it when you step into a movie theatre as a person living in one world, and then a couple of hours later you emerge from it feeling as if you've just entered another. Before long, though, this spell making everything have a, ahem, dazzling quality wears off and the world is once again stale in comparison. But what saved me from checking my watch was Jacob. I've never really been a huge fan of his; in Twilight, New Moon and Eclipse (book-wise and film-wise) I thought he was whiny and overly obnoxious, and really disliked him for being so adamant about hating Edward and trying to take Bella from him. But reading (and watching) Breaking Dawn really changed that. (Psst! If you haven't read/watched Breaking Dawn, skip this paragraph and resume at the next!) He stops being so arguably selfish and starts showing respect for Bella's decisions and even the entire Cullen family. How he stepped up to protect Bella from Sam's pack was absolutely amazing! I'd say that's my favourite part of Breaking Dawn; when he essentially moves in to the Cullen house and really gets to know all of them more. I love the moment when Carlisle and Esme say something to Jacob about protecting their family, and Jacob turns to them and agrees that he now truly can see them as a family as strong as his own. He definitely won me over right there. Oh man, and those moments when Bella was dying on the operating table? Unreal. Though perhaps a little too much blood for me but what can I say, I'm squeamish! So now I've hopped on the Team Jacob bus! I'm never going to stop believing that Bella and Edward are meant for each other – Bella and Jacob in my mind just doesn't work. But from the perspective of which character I love the most and appreciate that Bella needs in her life to keep her own sanity in tact, that's where Jacob comes in. He's definitely a loyal werewolf and an amazing friend to have! I can't wait for Part 2 either. Part 1 ended with the most perfect cliffhanger! Though I do worry what they're going to do with it – if they want the film to do well, they're going to have to adapt the story a whole lot to make it interesting enough. The ending to Breaking Dawn at the moment pretty much lacks the right amount of transferrable cinematic form. So that'll be interesting. I really want to know now, you guys, whose team are you on: Team Edward, Jacob, or Switzerland? And have you seen Breaking Dawn yet? What did you think?